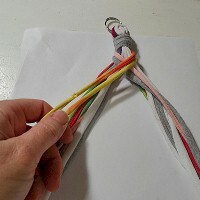 This Bonebraid Keychain Craft is a great project for the kids to make for Dad for Father’s Day or as a camp project for their own keys. It is always good to learn new skills that can be turned into useful items while recycling materials that might go into the landfill. Trivia: The Bonebraid is also known as the fishtail braid, or the herringbone or fish bone braid. It is a popular hairstyle too. Cut a long t-shirt strip in half (set the second half aside) and stretch it out. 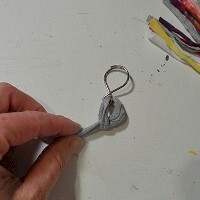 Make a lark's head knot by folding the strip in half and slipping the looped end through key ring. Now thread the two loose ends up through the loop and pull tight. Take 15-16 long t-shirt strips and stretch them all out. Gather them all together, side by side. 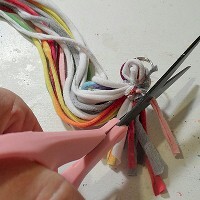 Fold the top few inches down and tie the strip that is on the key ring around all the strips. 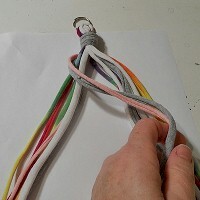 Tie a knot and add a little hot glue, then tie another knot and glue again. Trim the ends of the key ring knot completely off. Turn it over and add a little glue to the strips where the bend is. Trim the short ends of the strips off as short as you can. Take the other half of the strip that you set aside in step 1 and using hot glue as you go, wrap it around the trimmed edges, hiding them. Lay the keychain down facing right side up. Separate the strands into two sections. Grab two strips from the BACK left and cross them over and add them to the strips on the right. Grab two strips from the BACK right and cross them over and add them to the strips on the left. Repeat this process, working your way down until your braid is as long as you want it. Turn the keychain over. 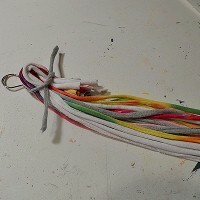 Take another strip, stretch it out and wrap it around the end of the braid, tying in a knot and securing with hot glue. Trim off the ends of the knot. Trim the fringe and you're all done!